Successfully Added Bar Cell Phone - Slim Profile Media Phone + Bluetooth to your Shopping Cart. Slim bar style dual band (900MHz, 1800MHz) cell phone with rich bluetooth and modern media features. 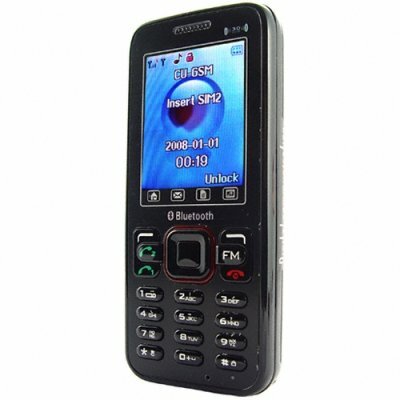 This easy to use entry level mobile phone is a good little phone with a modest price. Do you own a small business and need to buy functional but budget friendly phones for your employees? Do you need to buy a good phone for someone that has the bad habit of loosing their phone? Then this phone is for you! This cellphone is first and foremost an easy to use phone. It has a simple to dial keypad, active buttons for either SIM card, and a phonebook for storing 800 contacts. At the same time, this phone still has many of todays popular phone features including a rich bluetooth manager, wonderful media and software tools, and a simple to use color display. Additional notable features include a 3.5mm jack for plugging in your own HQ earphones, WAP with speed adjustment for easier web browsing, and FM radio receiving and recording. A wonderful cell phone to feature in your online store. Order your stock today and we will ship it out via your favorite express carrier tomorrow. Slim profile media phone with rich bluetooth feature set. Easy to use phone with dual SIM and large capacity contact manager/phonebook. Integral standard earphone jack; use this baby with your favorite headset.